[AUTO](VC) Limit Break 4 (This ability is active if you have four or more damage):[Counter Blast (1) & Choose three cards with "Eradicator" in its card name from your hand, and discard them] At the end of the battle that this unit attacked, if the attack did not hit during that battle, you may pay the cost. If you do, [Stand] this unit, and this unit gets [Critical]+1 until end of turn. This ability cannot be used for the rest of that turn. 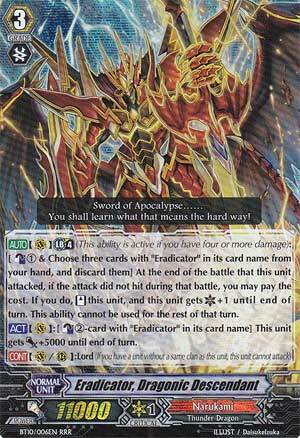 [ACT](VC):[Counter Blast (2)-card with "Eradicator" in its card name] This unit gets [Power]+5000 until end of turn. ...normally, the fact that a unit is part of a Legion would make it restrained as it requires you to utilize more units from said Legion, but because Eradicators are one of the most supposted Legions in the game, it barely becomes a restrain at all, and something like that for a card like THIS, it's borderline unfair in a late game scenario where you would have to try and guard as much as possible. Descendent is a solid 11,000 power and can get even better than that with using said support and his Limit Break! When I mean by, "said support", I mainly mean not only his Especial Counterblast skill where he gains 5,000 power for a cost of 2, but also from the Eradicator skills to minimize rear-guard threats and by utilizing the Break Ride for a hefty power boost, so that he can alreasy be at a solid 21,000 power by himself and even better should you use his Espcial Counterblast boosting skill and any boosting rear-guards along with it. But wait, there's more! The Limit Break is where Descendent becomes one of the deadliest and most pressuring cards in the game. If Descendent misses his attack, then you can discard 3 Eradicators from your hand to not only Stand up Descendent, but also give him an extra Critical! This is practically like the Neverendo combo, but all in a one package card with an extra Critical as the bow. Should this follow after a Break Ride, then Descendent is attacking for at least 21,000 power/2 Critical, and should you Check any Triggers from either Twin Drive, then we're looking at a potential 31,000 power with even more Criticals supporting it! The only drawback to this is what I mentioned earlier, and it's the fact that it's a Legion based card, but with what Eradicators currently have along with what they are about to get, it's barely a drawback at all and is definitely my pick as the best card from Set 10 and one of the best cards of 2013!